The outcome is a profoundly personal and joyful expression of faith, unique to each child’s relationship with God. To learn more about the Spiritual Formation Goals for The Catechesis of the Good Shepherd, click here. The Good Shepherd Catholic Montessori is the only school in the Archdiocese of Cincinnati and one of just a handful of schools nationwide that completely integrates Montessori education with the Catechesis of the Good Shepherd. All students, regardless of creed, are provided with the same spiritual formation through CGS. 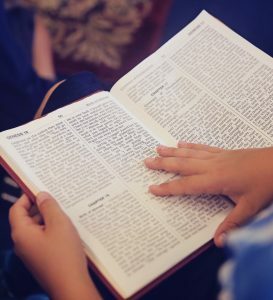 Catholic students preparing to receive the Sacraments in their home parish are provided with additional religious instruction, again drawing from the rich materials of the catechesis. Children from 3 to 6 years of age have demonstrated a particular sensitivity to the following points: Jesus Christ as the “Good Shepherd” who protects His sheep and calls them each by name; Eucharist as the greatest gift of the love of the Father; Jesus Christ as the “light of the world” and Baptism as the act with which this light is given. The Catechesis provides close links to scripture and liturgy – with a special emphasis on scripture. Dr. Cavalletti believes that we learn to recognize God through the Bible, particularly through those events that constitute the basis of Christianity: the life, death, and resurrection of Jesus. Materials on the life of Christ and his teachings help make the mystery of God concrete for the child. The geography materials establish Jesus as a real person in time and space and Israel as the land through which God realized salvation for all. Infancy narratives announce the Incarnation with the words of Scripture, moving from the Annunciation, to the Birth of Christ, to the Flight into Egypt. The models of Jerusalem and of the empty tomb are the starting points for the Paschal narratives and the child’s celebration of the Easter mystery. Selected parables serve as keys to unlock the mystery of the kingdom of God and to nurture the child’s natural sense of wonder. The 3-6 year old child enters the mystery of the Mass through the most important gestures including the preparation of the chalice, the epiclesis and offering, and the gesture of peace. From these gestures the Mass emerges as the Sacrament of the Gift. The child becomes acquainted with the historical character of the liturgy through the events of the Last Supper, Christ’s death, and His resurrection. Materials that embody the liturgical colors and calendar situate the child in the church year. A prayer corner also reflects the liturgical cycle with appropriate colors, prayers, songs, banners, and readings to enhance the rituals and celebrations of the seasons. The elementary child is captured by the image of the True Vine. “I am the vine, you are the branches. Whoever remains in me, bears fruit in plenty; for cut off from me you can do nothing.” The proclamation responds to the deep need of the older child to know better their relationships with God, family, friends, and the larger community. Children at this age seek guidelines. The moral parables offer a model for comparing their behavior with that of Pharisee, the Tax Collector, or the Good Samaritan. The Found Sheep, the Found Coin, and the Prodigal Son are examined as the children prepare for the Sacrament of Reconciliation. The proclamation and meditation stress God’s love, which is constantly forgiving. The elementary children see the parts of the Mass – the Liturgy of the Word, the Preparation of the Gifts, the Eucharistic Prayer, and Communion – as one unity. The children participate in a four-day retreat prior to the celebration of First Eucharist. Preparation of personal missals filled with illustrations and prayers is a process which deepens their love and understanding of the Eucharist. The Good Shepherd Catholic Montessori Key Area: Sacramental PreparationThe Good Shepherd Catholic Montessori offers sacramental preparation for First Reconciliation and First Holy Communion. 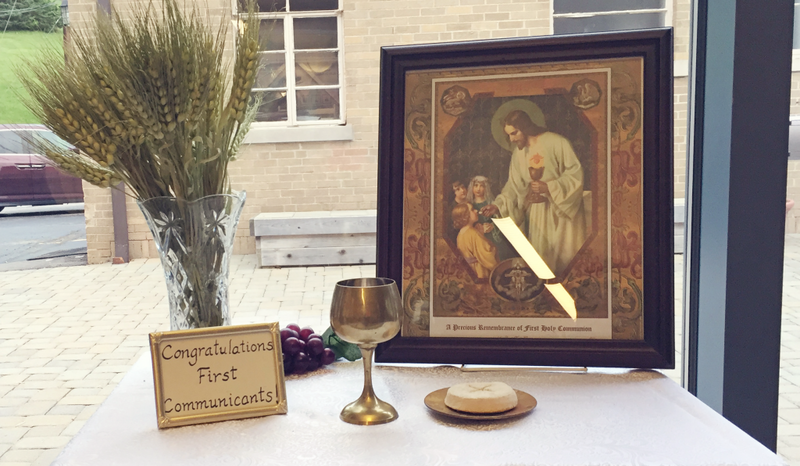 The four-day “First Communion Retreat” is a particularly rich and joyful time that provides life-long memories for children coming to Jesus in the Eucharist for the first time. The imagination of the older child and his agility with the concept of time are powerful stimuli to explore the past and the future. The first time line, a ribbon fifty meters long, focuses on the high points in the history of salvation from creation through the redemption to the Parousia. Another presentation focuses on the many gifts we receive from God – rocks, minerals, flowers, fruit, friends, family – culminating in God’s gift of His own divine life, in the person of Jesus, a gift which will pervade the whole universe at the completion of history. For the 9-12 year-old children, a third presentation of the history of salvation focuses on the plan of God in history as a plan of communion, a plan which links all people together. The emphasis is on our response to this unfolding generosity of God and the responsibilities that come with receiving God’s great gifts. “What is the kingdom of God and my place in it?” is a query which begins to lay the foundations for a life’s commitment. “The Atrium” is the name for the prepared environment offered to the children in the Catechesis of the Good Shepherd. The atrium is intended to offer a “retreat center” atmosphere for children. It is a place where children experience the joy of falling in love with God. We invite parents to tour this beautiful spiritual environment for children. The Good Shepherd Catholic Montessori is the only school in the Cincinnati area and one of just a handful of schools nationwide that completely integrates Montessori education with the Catechesis of the Good Shepherd. Portions of the text on this page are taken from the booklet, “The Catechesis of the Good Shepherd”, published by the National Center for the Catechesis of the Good Shepherd, Oak Park, IL.